Fresh Crisp Romaine Lettuce, Shaved Parmesan Cheese, Homemade Garlic Croutons!!! Served With Dressing Of Your Choice!!! Delicious Jumbo Cheese Ravioli Cooked To Perfection Tossed In Our Famous Marinara Sauce!!! Delicious Pene Pasta Cooked Al Dente, Fresh Marinated Grilled Chicken, Fresh Steamed Broccoli, Tossed In Our Amazing Creamy Alfredo Sauce!!! Fresh Crisp Iceberg Lettuce, Fresh Sliced Green Peppers, Red Peppers, Red Onions, Cucumbers, Cherry Tomatoes, Shredded Carrots, Served With Dressing Of Your Choice!!! Delicious 1oz Meatballs Topped With Our Famous Marinara Sauce!!! Amazing Lasagna Layered With Fresh Cooked Ground Beef, Ground Sausage, Peppers, Onions, Garlic, Ricotta Cheese, Mozzarella Cheese, And Our Famous Marinara Sauce!!! Delicious!!!! Our Delicious Pene Pasta Cooked Al Dente Tossed In Our Famous Marinara Sauce!!! Our Delicious Pene Pasta Cooked Al Dente, Fresh Marinated Grilled Chicken, Graded Romano Cheese, Tossed In Our Homemade Garlic Butter Sauce!!! Amazing Sweet Italian Sausage Cooked To Perfection, Fresh Grilled Peppers, & Fresh Grilled Onions!!! Delicious Lasagna Layered With Fresh Grilled Peppers, Onions, Mushrooms, Eggplant, Garlic, Ricotta Cheese, Mozzarella Cheese, And Our Famous Marinara Sauce!!! Amazing!!! Your Choice Of Our Delicious Homemade Roast Beef, Ham & Cheese, Turkey & Cheese, Tuna, & Our Homemade Chicken Salad Served On Bakery Fresh Finger Rolls!!! 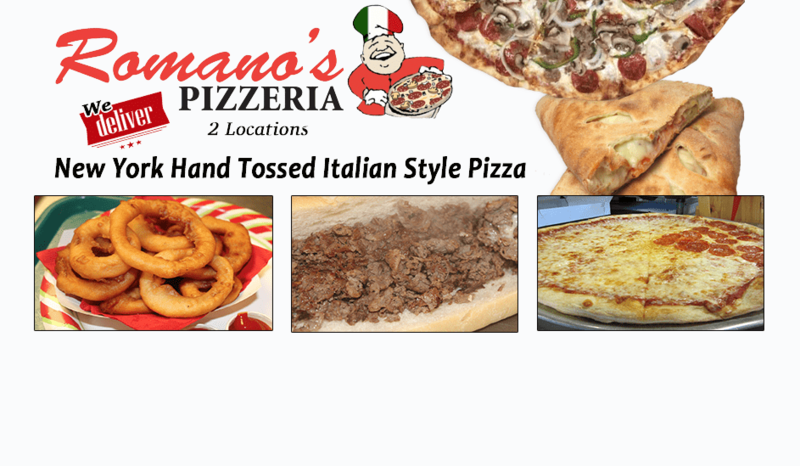 Romano’s Pizzeria offers catering for any event. From birthday parties, anniversaries, holiday events, special occasions, mercy meals to weddings our catering services and deliciously prepared meals are a great fit for your special event. Call us today to book your event or for more catering information.